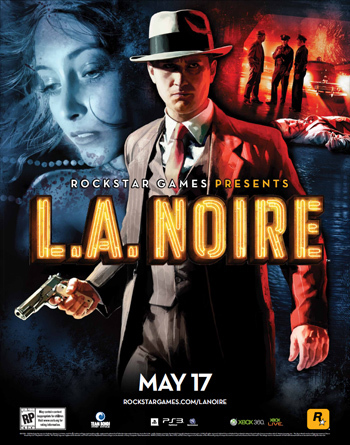 L.A. Noire is a 2011 game developed by Team Bondi and produced by Rockstar Games, taking place in post-war 1940's Los Angeles. 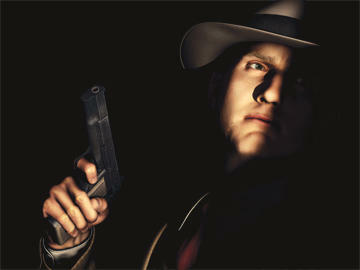 The player controls Detective Cole Phelps (voiced by Aaron Staton of Mad Men fame), a returning veteran of WWII. 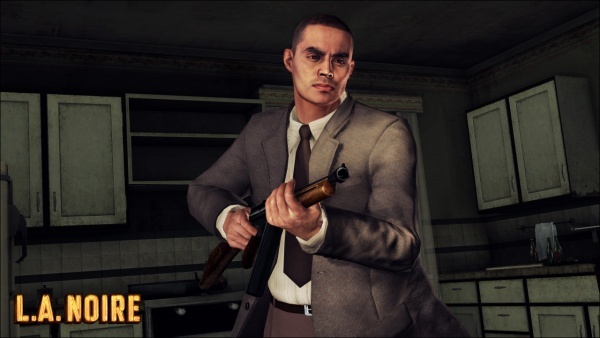 The game incorporates revolutionary 3D face mapping using multiple cameras to realistically capture the actor's facial expressions, this is important to the games interrogation segments, where reading suspects faces is vital to solving the several cases given. 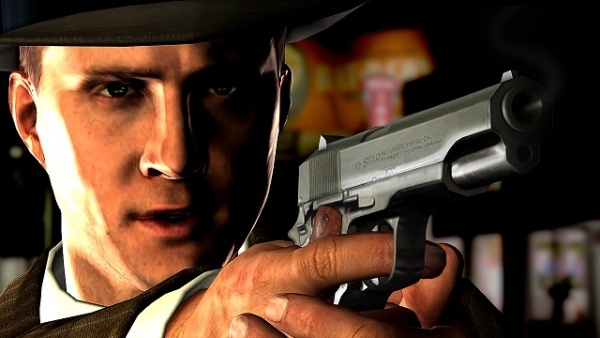 The Colt M1911A1 .45 pistol is prominently used in the game as sidearm of the protagonist Detective Cole Phelps (voice of Aaron Staton). His partner in Ad. Vice, Det. 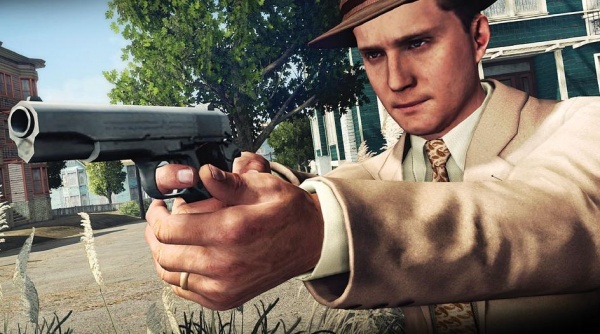 Roy Earle, also uses the Colt M1911A1 as his sidearm and it pops up periodically in the game in crime scenes and in the hands of criminals. Oddly, the texture is from the Star Model B (a Spanish clone of the M1911 pistol). 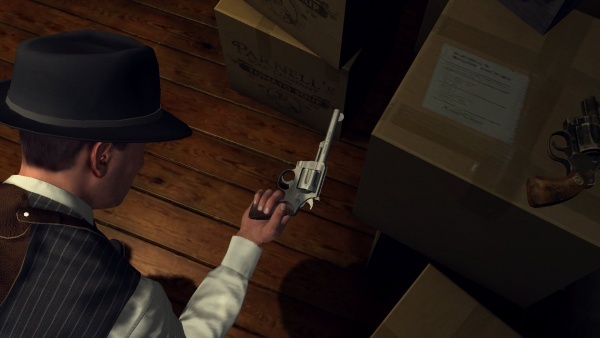 The pistol is missing the barrel bushing and external extractor of a real life Star pistol, so it is very likely that this is either an attempt to curve copyright issues and as a sly nod to Rockstar Games who published the game. 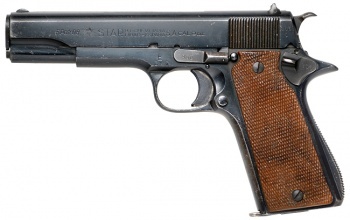 Star Model B with blue finish - 9x19mm, note the specific slide dress that's shared with the in-game 1911. Cole aims his 1911, showing us the Star slide dress. Note the slide stop on the right side, showing that the gun texture is just mirrored to the right side. Cole with his Colt M1911A1 at the ready. 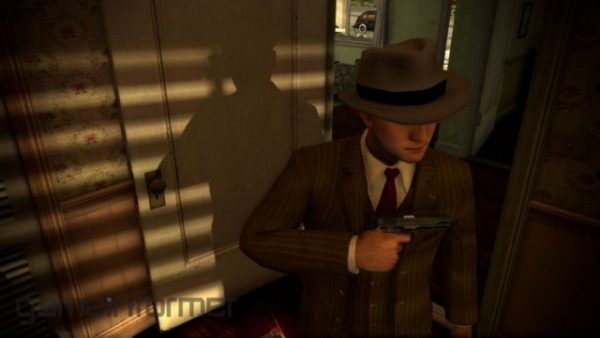 Cole draws his Colt M1911A1 in a pre-release screenshot, revealing the mirrored slide stop. 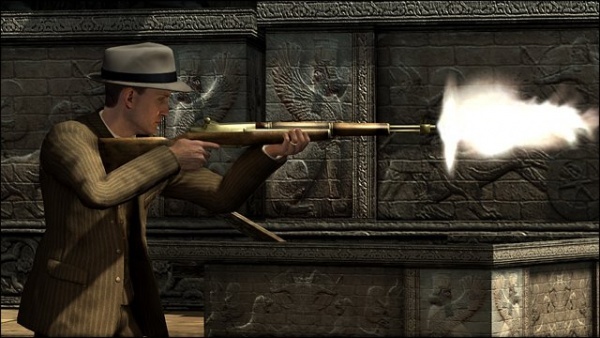 Cole aiming his Colt M1911A1 while wearing the exclusive "Detective Sharpshooter Suite". Note the better detailed model, albeit still lacking the barrel bushing. 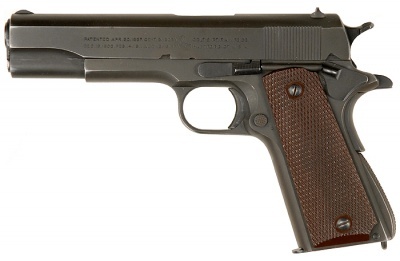 Note the plunger tube assembly above the grip, a feature that isn't on Star Model 1911's but on most other 1911 variants. A screencap of Cole's 1911, showing the slide dress again. Cole aiming his Colt M1911A1. 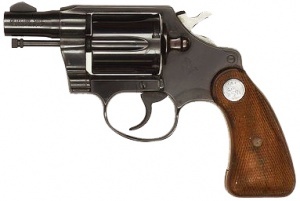 The Colt Detective Special appears as most of the detectives's sidearms in Los Angeles and in many of the "Street Crimes" that pop up during major cases. Phelps's partners in Traffic, Homicide and Arson, Bekowsky, Galloway and Biggs carry the Detective Special. Biggs claims never to have fired his weapon in the line of duty, which is quite ironic, because any time the player responds to a call requiring the use of deadly force, Biggs appears to blindly fire his weapon as quickly as possible, and never runs out of spare ammunition when reloading. Occasionally, a uniformed officer uses a Detective Special, but this is likely a developer's error. Few street cops wanted, nor were authorized, to carry a snub-nosed .38 on-duty. Bekowsky draws the Detective Special. Bekowsky with his Detective Special drawn while he and Cole investigate a crime scene. A masked bank robber aims a Colt Detective Special during the opening shootout. 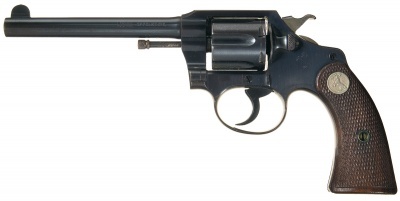 The Colt Police Positive revolver in .38 Special appears as standard issue to uniformed police officers. 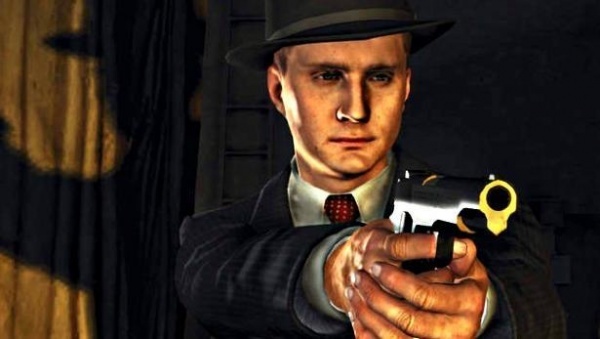 Cole Phelps uses it as a patrol cop in the first chapter. Strangely, it also appears as Bekowsky's sidearm in "Marriage Made in Heaven" when chasing Sabo, despite him carrying a Detective Special throughout the other cases. This is likely the same reason why some uniformed patrolman are sometimes seen with a Detective Special. Note the actual LAPD duty-issue weapon was a Smith & Wesson Model 15 (at the time, called a "Combat Masterpiece"), from the late 1940s all the way up to 1988, when it was swapped out for the Beretta 92F. 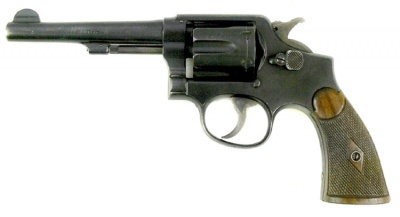 It's ID'd as a Police Positive due to it sharing resemblance to the Colt Detective Special, which is both accurate to the real world firearms and probably a simple reuse of the DS's model with a different barrel. Bekowsky and Phelps stand over Sabo, Bekowsky armed with the Police Positive. Note the short ejector rod, just like the Detective Special model. 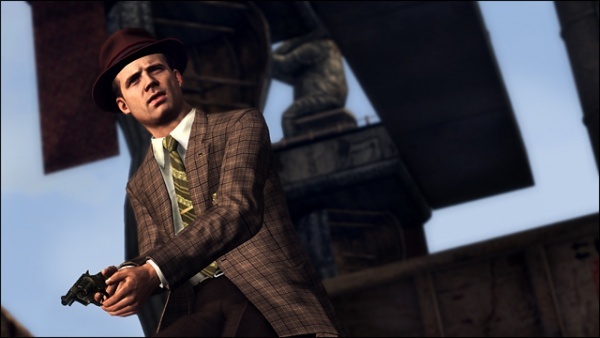 A Browning Hi-Power can be seen in a screenshot carried by Cole Phelps. 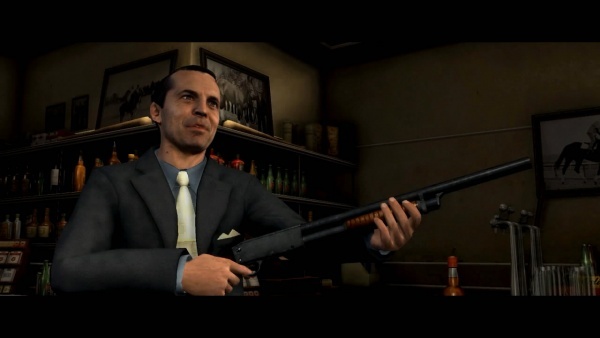 However, it is the in-game sidearm of retired Marine sergeant and insurance/district attorney investigator Jack Kelso. He starts out with a nickel plated version, but is disarmed of it by thugs who kidnap him, and switches to a standard blued model for the rest of the game. It can be distinguished as such by its appearance and 13 round magazine capacity. 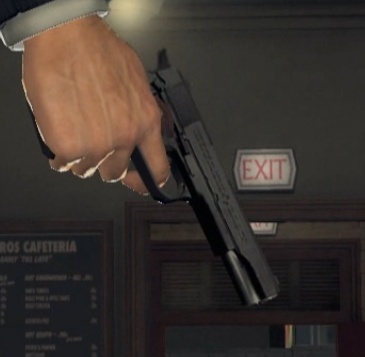 However, the game still renders the pistol as a 1911 in cutscenes. 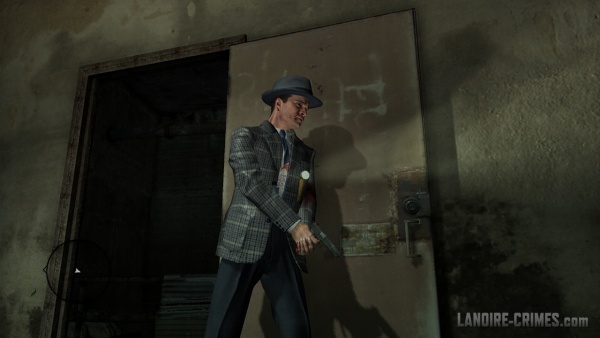 The weapon also appears when Phelps wears "The Broderick" DLC suit and like Kelso's original gun, is nickel plated. 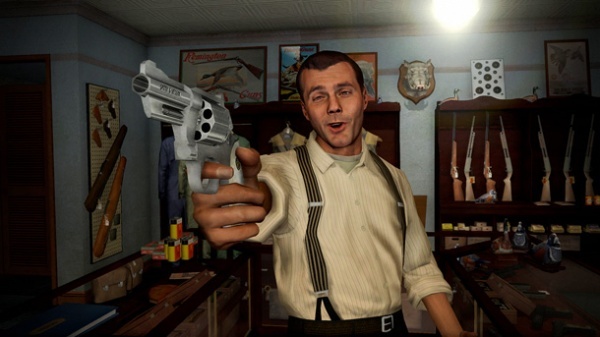 Cole cradles a Hi-Power in a pre-release screenshot, finger wrapped around the trigger. Cole moves forward with his nickel Hi-Power while in "The Broderick" suit. Jack Kelso clears through the sewers with his normal blued Hi-Power. 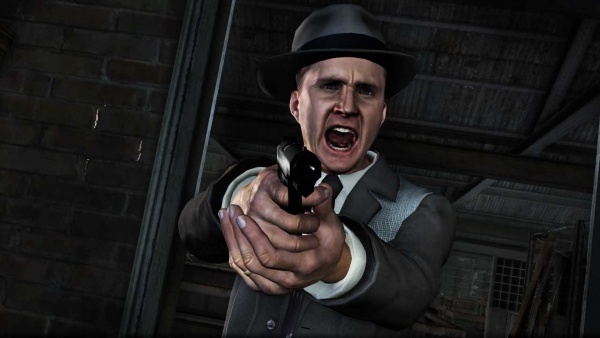 Cole Phelps, most of the LAPD and plenty of criminals use the Ithaca 37 as their primary shotgun. Notably used by Leroy Sabo in the "Marriage Made In Heaven" case in the Traffic desk as well as by Phelps in the game's opening bank shootout. By default, each police vehicle, including the cars owned by each partner, carries an Ithaca 37 in the trunk at all times. This is correct for the time, as the LAPD used, and still uses, the Ithaca 37 with 00-buckshot rounds and a parkerized finish. Cole runs toward the bank in the game's opening shootout, Ithaca 37 in hand. 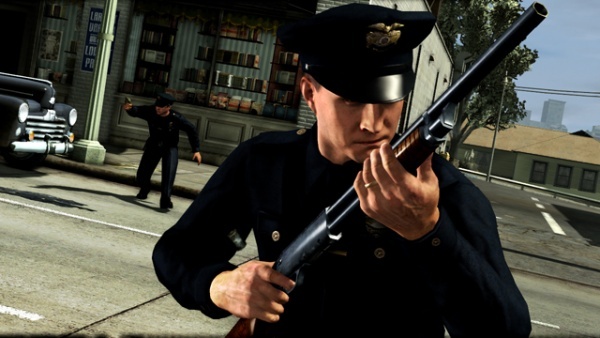 Visible also is his partner, Officer Dunn, with a Colt Detective Special, in game, he uses a Colt Official Police, however. Another shot of Officer Phelps in the intro shooting. Leroy Sabo draws his shotgun in the "Marriage Made In Heaven" case. In the mission Manifest Destiny, Cole discovers a rack of stolen BARs and is later used by a random henchman in an ambush. 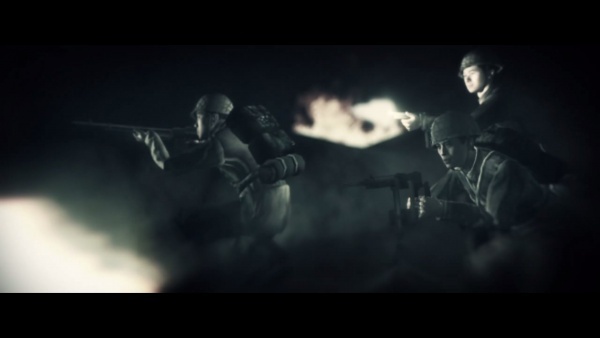 It's used by enemies in the last missions of the game as well as some IJA soldiers in one of the WWII flashbacks, probably as a generic placeholder weapon. Jack Kelso can use it heavily in the last mission to great effect. Cole examines the henchman's BAR. Note the excessively large M1918A1 marking, which is inaccurate as the in-game model is that of the WWII standard A2. Note the charging handle seems to vanish when viewed from above. 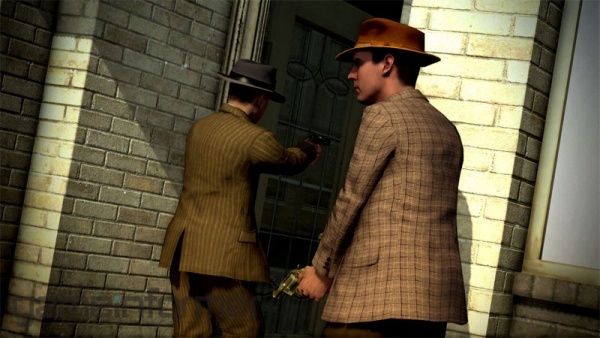 Cole carries his BAR in a pre-release screenshot, hence why he's carrying the gun with Detective Galloway, way before the gun shows up in-game. A Japanese soldier use a BAR on the left most likely picked up from fallen US Marines. 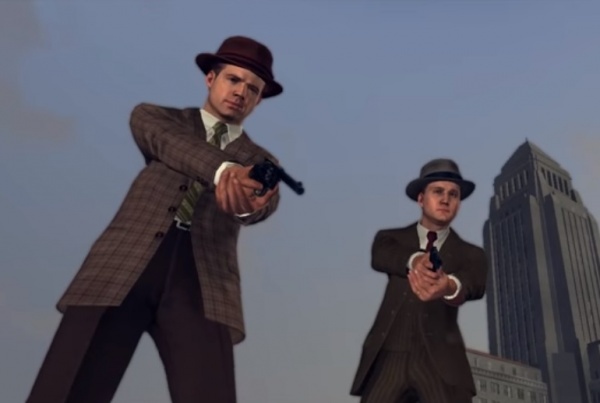 Cole Phelps can acquire the M1 Garand from criminals at random shootouts. street crimes and during cases, it also appears in the arsenal of the USMC during the WWII flashbacks. In game it's very powerful, dropping targets with one shot. The rifle seemingly has an odd bronze color to the metal components, for reasons unknown. Cole firing an M1 Garand at a threat, note the lack of overall detail on the rifle. 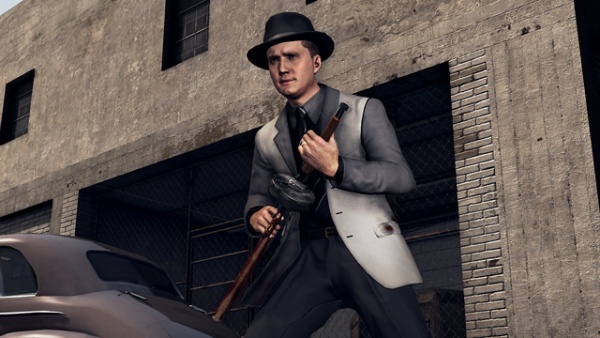 The M1A1 Thompson is seen in the hands of various criminals throughout the game, specifically in the intro bank robbery and by suspect Juan Garcia Cruz in the case "Reefer Madness". There's a DLC version known as the Chicago Piano Gun, a reference to the earlier M1928 pattern but appears as just an M1A1 with a 50 round drum mag fitted inside. This is impossible as the M1A1 didn't have the horizonal cuts in the magwell to accept drums. This weapon appears in the trunk of any car used in cases when the DLC is purchased. 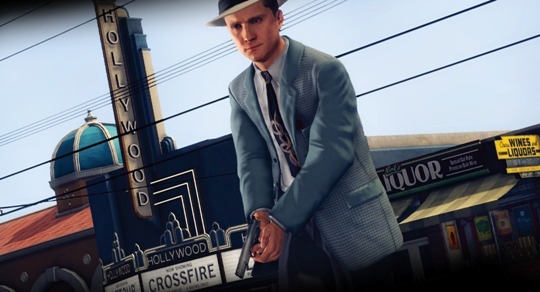 Cole (wearing the unlockable "Sharpshooter" costume) armed with the "Chicago Piano Gun", note the clipping with Cole's right hand and the inaccurate drum mag. A suspect goes down clutching his Thompson, impressively displaying trigger discipline. 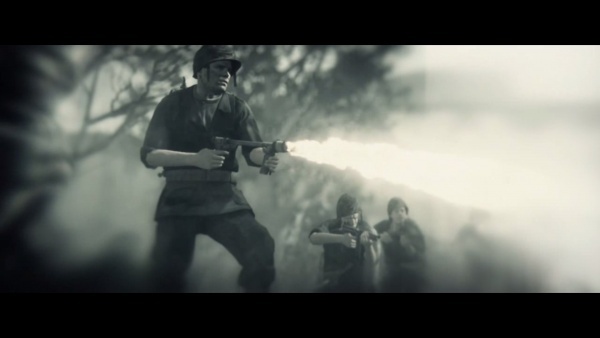 Cruz wields his SMG in a pre-release screenshot. 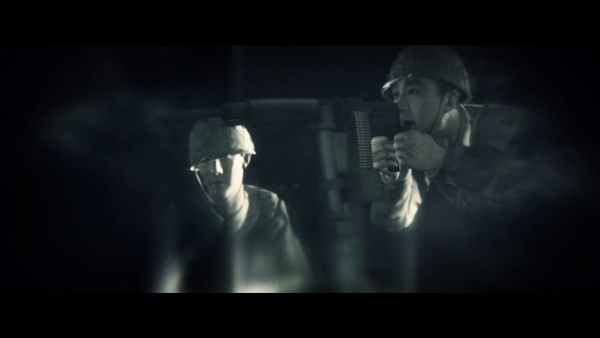 A Japanese soldier on the right uses a Thompson, which is either scavenged from US soldiers or more likely simple model reuse to save on dev time. 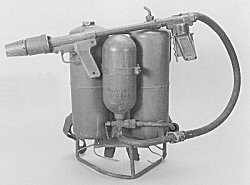 An M2 Flamethrower is an optional weapon in the last mission "A Different Kind Of War", although the withering gunfire of the level makes it a cumbersome choice. It's also used in the WWII flashbacks and by character Ira Hogeboom. The game specifies that it's the M2-2 model. 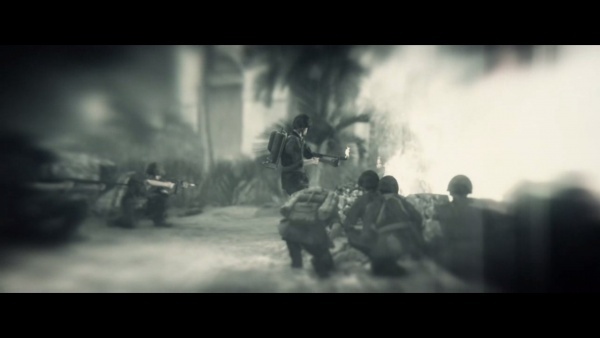 A Marine uses his flamethrower in the WWII flashback. The same scene from a different angle, showing the flamethrower tanks. An engraved, snubnose Smith & Wesson Model 27 is the firearm found in the first case Cole does as a patrol officer, the gun shop owner calls it a "S&W Model 27 Registered Magnum" and it's only available by special order. 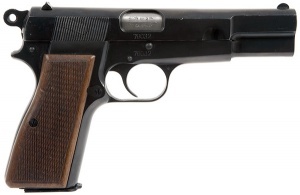 While special order is correct for a custom gun like it, the use of "Model 27" is inaccurate as S&W didn't begin using the "Model X" designation until 1957. 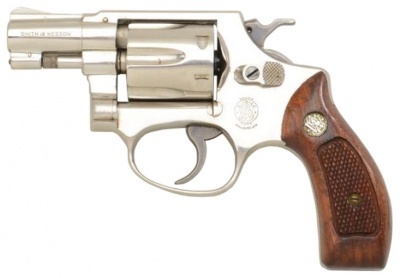 Smith & Wesson Registered Magnum - .357 Magnum. This particular S&W was ordered and carried by Lt. Col. Gen. Staff. George S. Patton. The gun shop owner inspects the revolver, waving it around with his finger on the trigger. Note the "Remington Guns" poster and the rack filled with Ithaca 37's and other rifles. Cole finds the revolver at the crime scene. 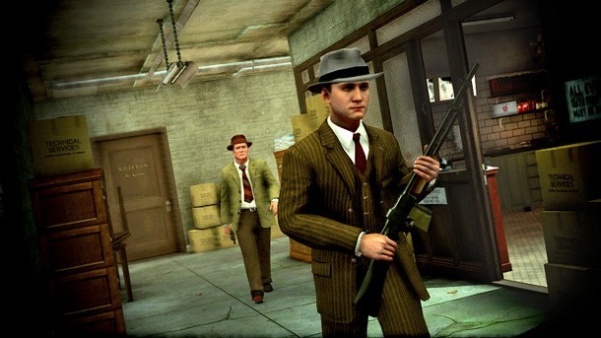 Cole Phelps finds an FN Model 1922 with wooden grips (Serial Number 01138) in a garbage can on the scene of the "Buyer Beware" case, it is identified by the gunshop owner as an "FN Browning Model 1922, Europeans love 'em but they're hard to come by over here." 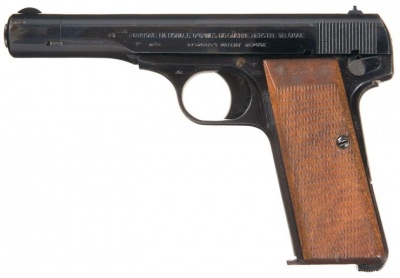 While the FN 1922 wasn't properly imported into the US until 1955, the in-game gun's simple brown wood grips indicate it's a model made during Nazi occupation, thus likely making the gun a GI bring back. Cole digs in a trash can and finds the Belgian pistol. Note the simple brown grips. The 1922 sketched into Cole's notebook in the evidence section. In the Vice mission The Set Up, Cole finds a snub-nosed nickel Smith & Wesson Model 30 on the ground near the body of Candy Edwards. He describes the ammo as ".32 caliber" which helps ID it as the Model 30. Cole finds the Smith & Wesson near the body of Candy Edwards, presumably her personal sidearm. At first, it is believed it is a murder weapon. The cylinder clearly holds six shots, so it can't be a Smith & Wesson Model 36, which only holds five and the 36 wasn't made in .32. Note the dented primer on one of the rounds, fired by Candy only seconds earlier. Cole finds a Smith & Wesson Model 10 (presumably the early "M&P" or "Victory" model) inside a suspect's house in the "Reefer Madness" Vice case. Cole picks up a Smith & Wesson Model 10 during an investigation. When enlarged to full-size, one can clearly read "Smith & Wesson" on the tapered barrel, confirming its identity. Note the Detective Special off to the right, the suspect was said to have "loved guns". Seen in the display windows of gunshops in the game are ornate Colt 1851 Navy cap and ball revolvers. Seen in the display windows of gunshops in the game are ornate Remington 1875 revolvers. The custom engraved Remington 1875 used by Gene Hackman in The Quick and the Dead (1995) - .45 Long Colt. M1 Carbines are seen in flashbacks to WWII during Okinawa, used by U.S. Marines. Multiple Bolt Action .22 rifles are seen in the game's gunshops, make and models unknown. Japanese soldiers seen in the WWII flashback in Okinawa fire Type 92 Heavy Machine Guns at the U.S. Marines. Curiously it's the only accurately rendered Japanese weapon as the rest of them are armed with Thompsons and M1 Garands, most likely to save on development time rather than make new weapon that would only be used for a few cutscenes. Weirdly, the in-game gun seems to use a belt feed over the Type 92's Hotchkiss style stripper clip. 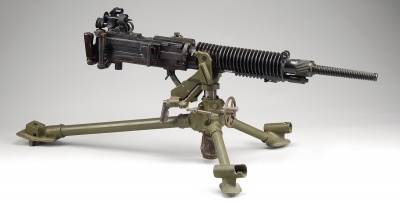 Type 92 Heavy Machine Gun - 7.7x58mm SR. The Japanese gunner mans his Type 92, note the weird stubby belt and ammo bag. A Japanese gunner uses a Nambu Heavy Machine Gun while the other two soldiers use a BAR and Thompson.